It’s done! It's finally done! These frames have seriously been sitting on the floor of our office for almost two months. I have a legitimate fear of hanging things on walls. My last apartment was built in the 1920s... and had the crumbling plaster walls to match. Hanging art was practically impossible. The walls always crumbled to the pressure... either right away or 6 hours later in the dead of the night when I was fast asleep. Half of my old ikea frames are cracked in the corners thanks to those freaking walls. So, obviously, I'm a little scarred. In a burst of bravery, I tackled this gallery wall in THIRTY minutes last weekend. (Please ignore the slightly crooked frame above. Rest assured, it's now fixed.) I wish I could tell you the ins-and-outs for how I painstakingly planned the layout... but I didn't. I knew if I didn't act fast, my bravery would subside and the frames would continue to sit on the floor. I basically just started with the largest piece, and then gradually worked my way around it, stepping back after every frame to contemplate the layout and ensure everything looked balanced. See below for the play-by-play I texted the boyfriend in between hammer-wielding. And that's how I conquered my fear of hanging things on walls in 30 minutes. Now, I want to hang things EVERYWHERE. ALL THE GALLERY WALLS. 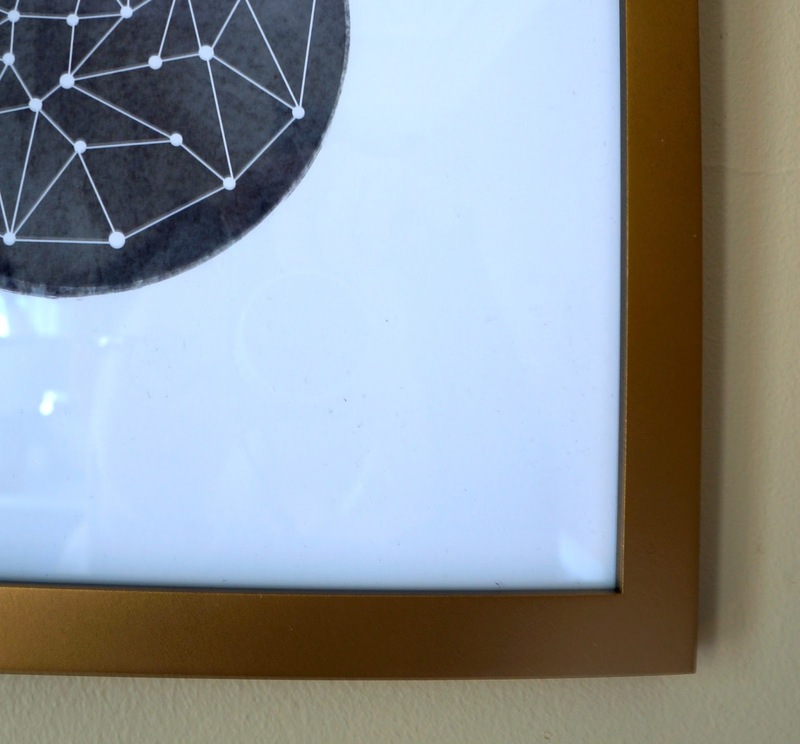 Oh, and I also sprayed 3 of my basic black frames gold for a little interest! I used Design Master spray paint in Antique Gold to tie into the vintage gold mirror on the other side and the as-yet-not-shared gold plant pot. You'll see all that soon! This was just what I needed! I'm gonna go for it. Awesome! Glad it was helpful :) Good luck!